Why Is HP Going to Keep Making TouchPads Through October? After killing the TouchPad and fire sale-ing them at a $100 to get rid of them, HP has announced that they'll still make TouchPads through October. What in the deepest depths of hell is going on? Couple theories: According to analyst Shaw Wu of Strene Agee, HP's deal with Taiwanese manufacturer, Compal, was for between 500,000 and one million TouchPads. Maybe HP hasn't sold enough TouchPads to finish that contract and opting out of the contract would cost more than just building dead dead dead tablets. Or maybe they've paid for parts and figured they might as well use them. 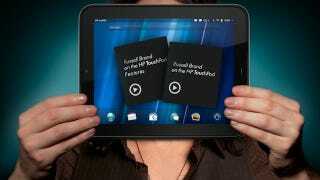 Or maybe the HP exec who said the Touchpad will make a comeback was right.